This Stock Gained 50% in 2018. Is It a Buy in 2019? No, this isn't some flashy high-growth stock. It's WD-40. There is nothing good about stock declines like this most recent one. Sure, some stocks may have lower valuations that could make them more compelling buys, but it's hard to push that buy button after watching your portfolio's value drop double digits in a few months. One stock that hasn't suffered from this most recent drop is The WD-40 Company (NASDAQ:WDFC). Yes, the company behind that ubiquitous spray can of lubricant that is probably sitting in your garage. Not only did WD-40's stock gain 50% this past year, but it is still hovering around its all-time high. Selling WD-40 is a pretty resilient business, but one-year gains like this for a company selling a consumer staple product seem a bit off base. So let's take a look at what went right for WD-40 in 2018 and whether it can maintain this torrid pace in 2019. Image source: The WD-40 Company. For long-term investors, WD-40 is pretty much everything you would want from a stock. It's a high-margin product with a strong brand to drive sales. Also, it is a product that requires little to no investment in new technology or capital spending. In fact, the WD-40 Company doesn't even manufacture its own products -- it uses third-party manufacturers -- so the cost of doing business is very low. The combination of high margins and low capital commitments translates to an incredibly high-rate-of-return business that pays a modest dividend and boosts per-share earnings with a steady diet of share repurchases. The stock's 50% gain in 2018 wasn't that much of an aberration, surprisingly, as the company has consistently trounced the S&P 500 on a total return basis. WDFC Total Return Price data by YCharts. A business this simple with results like this appears too good to be true. That may be the case for this stock. While the business itself has done incredibly well, Wall Street has taken note of its performance. 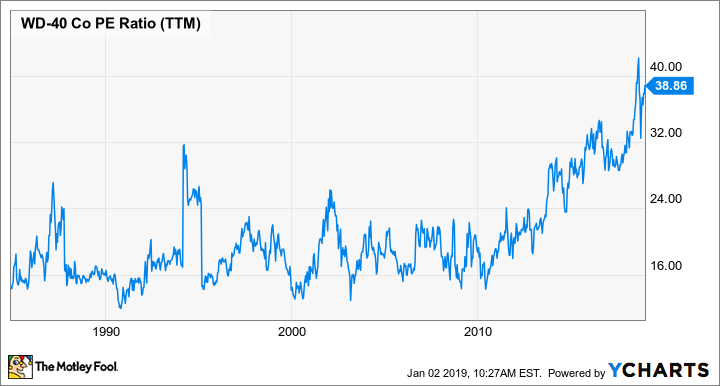 For the past decade, the valuation for WD-40's stock has increased rather steadily. This is a stock that traded at a price-to-earnings ratio between 15 and 20 for decades. Over the past 10 years, though, its valuation has been steadily increasing such that it now trades at a PE ratio close to 40. WDFC PE Ratio (TTM) data by YCharts. A valuation that rich is typically reserved for businesses with high growth rates. That can't really be said for WD-40 right now. Management expects revenue growth in 2019 to be in the 4% to 7% range, and it has slowly been backing away from some of its longer-term revenue goals in recent conference calls. If the company's revenue or earnings growth were to stall out in any way, it's not too hard to imagine the stock losing this premium valuation fast. Another banner year in 2019? 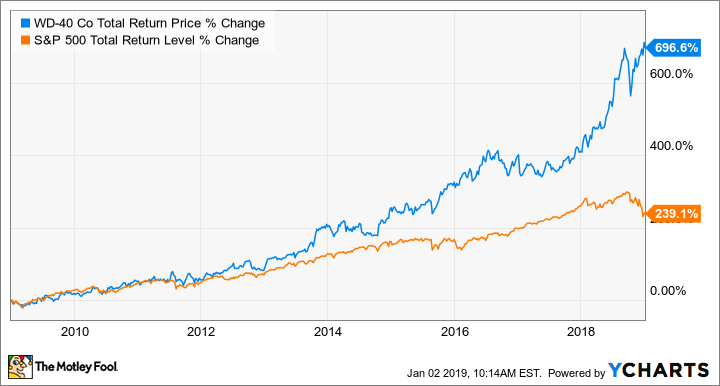 WD-40 the business and WD-40 the stock are two very different things right now. It's hard to find issue with the business. Sales of its flagship blue-and-yellow can of multiuse lubricant will likely grow modestly from raising prices and some expansion overseas. It also has a growing presence in more specialized products like degreasers, chain lubricants for motorcycles, and lawn and garden tool maintenance. With its high-margin sales and free cash flow, investors can reasonably expect steady earnings growth supplemented by increasing dividends and share repurchases. What WD-40's stock does could be an entirely different story, though. It's close to impossible to say if the market will continue to assign such a premium valuation to this stock. If it does, investors can likely expect another decent year of gains in 2019. It's a leap of faith, though, that the market will continue to value a company with 10% annual earnings growth at 40 times trailing earnings. While I'm a shareholder of WD-40 and would love to see another repeat performance, I'm not so sure I will. This is a stock that I intend to hang onto for a very long time, and investors looking at this stock can be relatively confident that it will grow your wealth over multiple decades. At today's price, however, it probably isn't the best time to be buying this stock. Check out the latest WD-40 earnings call transcript.